Reach in your pocket and you’ll pull out a little piece of magic. That rectangular box is able to connect people continents apart, access the world’s libraries, and deliver breaking news as it happens. Smartphones owe their success to the explosive growth in computing technologies — today, engineers can fit billions of transistors onto the tip of your finger. Even more ‘magical’ technologies are possible, and scientists believe that quantum computers hold the key to the next wave of technological even more “magical” technologies. In a major breakthrough, researchers at the Yale Quantum Institute have now developed the world’s first quantum information chip. 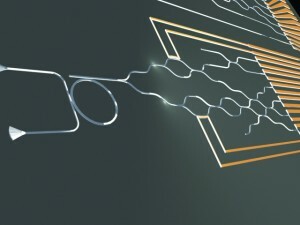 Professor of electrical engineering and physics Hong Tang and post-doctoral researcher Carsten Schuck report in a recent Nature Communications paper that they have successfully put the essential components of quantum information processes on silicon-based chip. This scalable technology could make theoretical quantum computation a reality, unleashing tremendous advances and producing answers that classical computers can never hope to attain. While quantum computing has been done in the past, it has always required room-sized setups. Now, with the power of microfabrication, the team of Yale researchers is hoping to make quantum computers even smaller than ever before through fundamentally changing how they are made. Quantum computers are a breed apart from the ordinary devices we are familiar with? Many people imagine them to be quite like our personal desktops, just much faster and smarter. Perhaps quantum computers could help us predict next month’s weather, or even discover better drugs, many think. However, these are tasks for supercomputers — powerful classical computers that already sit in remote facilities around the world. Quantum computers instead promise to rise to new challenges, like cracking currently unbreakable cryptographic codes by rapid factorizing large prime numbers and advancing our understanding of the physical world by performing complex simulations. Quantum computers differ from classical computers in one key way: Instead of having regular bits, they have quantum bits, or “qubits.” Bits are very simple units of data; they are either a 1 (‘on’) or a 0 (‘off’). However, computer engineers have designed logical systems that harnesses our ability to manipulate them at mind-boggling speeds. Today’s top supercomputers can manipulate a thousand trillion operations per second, simulating everything from high-end video production to the evolution of our universe. Quantum bits have three states instead of two: on, off, and a third position that is, strangely, both on and off. This third state is unique to quantum technologies, and it has far-reaching implications for our understanding of the world. It is a misconception to say that quantum computers are simply ‘better’ than classical computers. Although quantum computers use fewer qubits when compared to a classical computer’s bits in performing a calculation, it will be a long time before quantum computers can attain the power of our home desktop, and much longer before they reach the power of supercomputers. The power of the quantum computer lies in its ability to perform tasks that classical computers cannot do; because of the unique physics involved with a qubit, it is able to solve problems in a completely different way. The famously misattributed Einstein quote comes to mind: “If you judge a fish by its ability to climb a tree, it will live its whole life believing that it is stupid.” Our classical supercomputers have scaled the highest of trees, allowing us to see the islands of knowledge that lie across the ocean. But it will take the quantum computer’s ability to swim to finally get there. 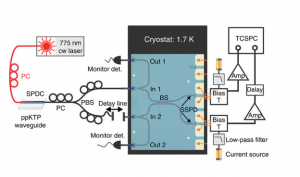 Although the new quantum chip is microscopic, the devices needed to keep it working are not. In order for the quantum chip to work properly, it needs to be cooled to only a few Kelvin, using the vacuum devices shown here. Yet, this is still a considerable improvement over older setups. But scientists still have a dilemma. Although the qubit has been created in laboratories, it is difficult to mass produce them. Classical computers have flourished because scientists mastered the art of silicon transistors. Bits are merely the idea that computers are built on; transistors hold the actual, physical representation of the bit. Likewise, qubits have been developed in fantastic algorithms, yet there has not been a truly scalable physical representation of the qubit. There are great ideas — Robert Schoekopf, director of the Yale Quantum Institute, was the inventor of the superconducting qubit — but a consensus on which direction to take has yet to be made. The major problem today seems to be one of scale. 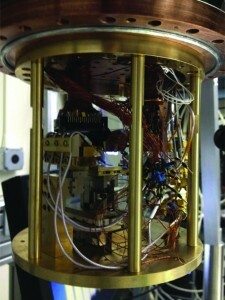 Although scientists can create qubits in the lab, they require temperatures close to absolute zeroalong withgiant room-sized tables of optical instruments. And that is only for a few qubits. “If we ever want to do something that goes to a large scale, something that classical computers cannot do, you need to have scalable technologies,” said Carsten Schuck, lead author of the paper on the quantum chip. His new development at the Yale Quantum Institute — the scalable quantum chip — tackles exactly that problem. With it, scientists can integrate as many qubits as needed onto a single chip. Schuck’s interest is with photonic qubits — that is, qubits that operate using the quantum nature of light. Those quantum properties have been demonstrated again and again in the laboratory, but it has been a challenge to scale them. Photons, or particles of light, have the benefit of being relatively resistant to environmental changes; they do not lose their quantum properties if the temperature changes microscopically, unlike the more sensitive superconducting circuit. To create a scalable quantum chip, scientists need to integrate three distinct components on a single chip: one to produce photonic qubits, one to propagate those photons, and the last to measure the photons’ final states. Any quantum computer would need all three components working together in harmony. That need for harmony led to the partnership between Schuck, a physicist intrigued by entangled photon pairs, and Tang, whose primary appointment at Yale is with the Department of Electrical Engineering. As experts in their respective fields, Tang and Schuck collaborated to do quantum information on a scalable platform. Tang and Schuck’s breakthrough with the silicon chip comes from merging their expertise to solve the propagation and detection problems. Tang’s expertise in microfabrication created waveguides for the photons that were only one millionth of a meter across. The configuration of these waveguides allows for operations to be performed on qubits, much like how transistors allow for operations to be performed on regular bits. These waveguides are unique and were fundamental to the function of the quantum chip. Meanwhile, Schuck’s experience allowed for the integration of quantum technologies onto this silicon chip The Superconducting Single Photon Detector, or SSPD, is a device specially engineered so it has the ability to detect the single photons that travel in the waveguides. In fact, because this detector behaves according to quantum laws rather than classical laws, it sees much more information than regular detectors. If the regular detector were a black-and-white camera, the SSPD would be akin to a color camera, collecting much richer information if used properly. Tang and Schuck have already verified a fundamental quantum interference effect using their detectors, proving that their chip is able to convey quantum information. Showing this to be true was no easy task. “The generation of this photon qubit is a random process, so we only have a probability of generating [it],” Tang said. In order to demonstrate the quantum interference effect, the team had to generate a very large number of photon pairs to guarantee that enough photonic qubits were produced. The successful generation and detection of qubits by their quantum chip opens new doors for research, emboldening colleagues to take the Yale team’s current chip and make further modifications to the waveguides, creating more complex algorithms and increasing the chip’s reliability. There is much work to be done. For now, Tang and Schuck have only integrated two components — the propagation and detection elements — onto a single silicon chip. The source of the photonic qubits is still generated by a laser some distance away, and for good reason. Placed any closer, the laser would heat up the SSPD, ruining any detection of the photonic qubits. “If we can put the source on the chip as well — that’s basically the dream of where we want to go,” Schuck said. These Yale researchers not only developed a new technology — they created a new paradigm for developing quantum technologies. The emphasis on balancing scalability with reliability is crucial for developing the field of quantum computing. Not so long ago, classical computers faced the same problem, with giant room-sized vacuum tubes providing the only way to manipulate bits. The invention of the transistor allowed for the steady improvement of computers, and today, they are tiny pockets of magic that we have accepted into our lives. Perhaps one day in the not-so-distant future, we will look back and marvel at how, once again, a new wave of technology has transformed our daily lives. Devoret, M H, and R J Schoelkopf. 2013. “Superconducting Circuits for Quantum Information: An Outlook.” Science 339 (6124): 1169–74. http://science.sciencemag.org/content/339/6124/1169.abstract. Chunyang Ding is a freshman in Saybrook College and a prospective Physics major. He currently serves as Operations Manager for the Yale Scientific and works in Professor Geha’s lab studying satellite galaxies. The author would like to thank Dr. Carsten Schuck, Professor Hong Tang, and Professor Liang Jiang for their time and enthusiasm in discussing their research.